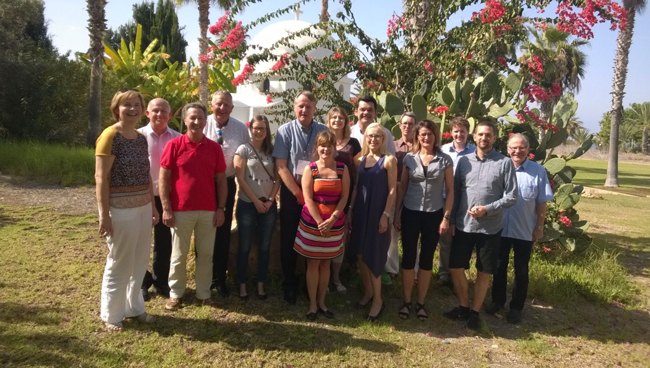 It was in the days prior to the annual Efvet conference in Paphos, Cyprus at the end of October 2015, that members of the transnational project team of EBBD+ gathered at the convenient location of Azia Resort and Spa to continue working on the development of their project. After the meeting in Vienna in spring 2015 much progress had been made on hot items as the renewed design of the website and the simplification of the accreditation process. After having met in Skype-meetings several times during the year, the physical meeting in Paphos was a happy gathering again. The meeting had been well prepared by the Finnish coordinators and the two days were well spent. Special attention was paid to the development process of the accreditation tool, the customer database and the new website. Colleagues from Rudolf Rempel Berufskolleg of Bielefeld had put much effort into the construction of a prototype that should encompass all three elements. Their presentation gave a clear insight into the possible new look of the instrument and was greatly appreciated by the members. By means of a workshop all members were able to make their own contribution to the development of this tool. As dissemination is an important element in EU-funded projects, this element was prominently placed on the agenda. All partners had submitted their national dissemination plans and it was discussed that from a dissemination point of view an updated brochure of the project would be very valuable. The project members were pleasantly surprised when the colleagues from Ludwigshafen presented the project’s Facebook-page. This is seen as an important means to create more awareness and involvement of potential and existing stakeholders. The project also prescribes that each partner should organise a national dissemination event. The timetable for this was discussed and agreements about target groups were reached. 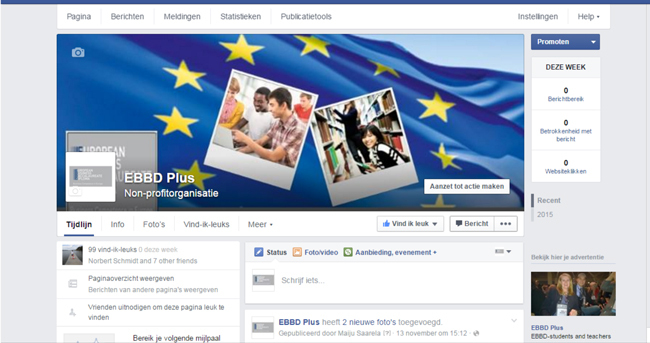 In order to make EBBD more attractive for teachers, a database will be filled with teaching materials. The partner from Eindhoven introduced the plans for this. The material will be made available via the website and can be seen as a strong means for a further proliferation of the curriculum of EBBD. Finally, the partners from Worcester, whose task it is to assure the quality of the products that are being developed, presented their opinion on the development of the project so far. After these two well-spent days the project partners split up in two groups: those that went home back to business, and those that took part in the annual Efvet conference that would start in a few hours.